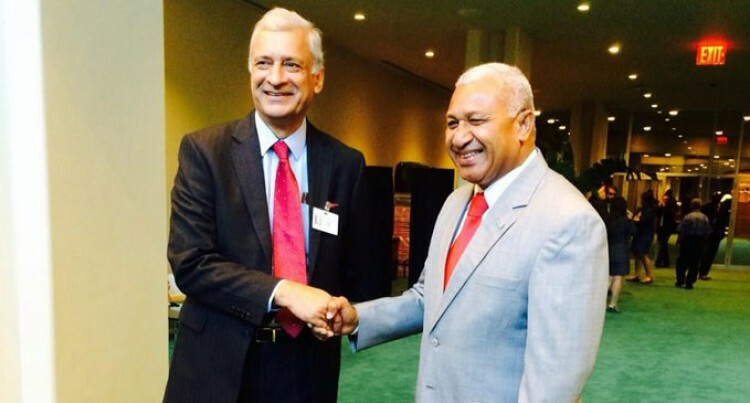 Below is the full text of Prime Minister Voreqe Bainimarama’s speech at the UN General Assembly in New York yesterday. Bula Vinaka and a very good afternoon to you all. I join those who have spoken before me in congratulating you, Mr President, on assuming office. Like them, I am confident that under your leadership, the 69th Session will be a productive one. And I also want to express Fiji’s gratitude for the leadership provided throughout the 68th session by His Excellency Mr John Ashe. Mr President, five years ago I stood in this great chamber and promised the global community that my Government would introduce the first genuine democracy in Fiji’s history before the end of September 2014. It is my honor to inform you that with the support of the Fijian people, I have kept that promise and I return here today as the duly- elected Prime Minister of the Republic of Fiji. At our general election on September 17th, I led my FijiFirst political movement to a decisive victory in the first election to be held under our new Constitution on the basis of equal votes of equal value. This Constitution replaced three previous constitutions since our Independence from Britain in 1970 in which governments were chosen under a weighted and discriminatory formula that separated the various communities and favoured some citizens over others. For nearly four decades, we laboured under a system that was undemocratic, unjust and unfair. Indeed, we were a case study of a nation that was supposedly democratic and casting itself as such, but was failing to meet some basic democratic standards: A common and equal citizenry, a common identity and a level playing field on which every citizen can excel. We have often heard it said that elections are key to having democracy. We in Fiji knew that this wasn’t the case, because our electoral system before it was reformed did not give true democracy. It did not facilitate justice, transparency or good governance. It was about reinforcing the power of elites and keeping the population divided into different communal groups. This weighted system perpetuated injustice for a great many of our people, created different classes of citizens and encouraged corruption. It was a system that no advanced democracy would accept for itself. The status of any Fijian in national life depended on their racial origin, whether they came from one of the chiefly or business elites, and even what part of the country they lived in. We needed a revolution to put us on the path to true democracy. And from the time that revolution began in 2006 to our election 10 days ago, we embarked on a series of reforms that have transformed our nation. More laws were passed during this eight-year period to improve our standard of governance than in the entire 36-year period since Independence. And central to this was the development of our supreme law – the 2013 Constitution – from which all other laws flow. It is the blueprint for the new Fiji. Now every Fijian enjoys equal opportunity and a common identity – Fijian. This name that was once reserved for the indigenous majority but now applies to everyone from the Republic of Fiji, just as the common name American applies to all from the United States or to any Australian from Australia. A range of social and economic rights have also been enshrined in our supreme law for the first time that comply with a number of United Nations conventions. The right to economic participation, a just minimum wage, the right to education, housing, health and adequate food and water. The right to live in an environment free from pollution – a principle we hope every nation will embrace as we strive for the preservation and protection of our natural surroundings. So today, I am proud to report to you that Fiji is a fairer, more just society, and a more compassionate society as we step up our efforts to alleviate poverty on the back of a rapidly strengthening economy. We have also set our sights on being a smarter country by introducing free schooling at the primary and secondary level for the first time. Plus an array of scholarships and a tertiary loans scheme to enable our young people to go on to higher education. Our vision is to cement our place as a pre-eminent Pacific Island nation, a true regional hub and a beacon of prosperity and progress for our smaller neighbors. And we intend to play a bigger role in the wider world to voice our collective concerns about such issues as the environment, climate change and the need to create a fairer trading system to benefit our people in the Pacific and in all developing countries. As we begin this new era in our national life, I want to thank those in this great community of nations who stood by us in recent years as we made the reforms that were necessary to create a better Fiji. Not everyone understood what we were trying to do. Some tried to damage us with sanctions, to degrade our quality of governance because we refused to accept their prescriptive and high handed approach towards us. But the majority of you recognised our right to determine our own future and came to understand that we were working not for the benefit of a governing elite but for the common good. To those of you who gave us your support – our friends – I extend the grateful thanks of the Fijian people. I also want to especially thank those countries which made up the Multinational Observer Group that declared our general election credible, free and fair. The co-leaders -Australia, India and Indonesia –plus Canada, the European Union, Israel, Japan, the members of the Melanesian Spearhead Group, New Zealand, the Republic of Korea, Russia, South Africa, Turkey, the United Kingdom and the United States of America. Vinaka vakalevu to you all. It has been a long and sometimes traumatic journey for our nation in the 44 years since Independence; four coups, a rebellion, four Constitutions and 56 days of shame in 2000 when members of our Parliament were held hostage. Fiji has struggled to be unified and cohesive, our development retarded by our inability to think and work as one nation, one people. But with this election, we have put that era firmly behind us. In our new democracy, we are all Fijians, not members of separate ethnic and religious groups. And having established a common and equal citizenry, along with a secular state, we intend to move forward together to finally fulfill our promise as a nation, to fulfill our destiny. I especially want to pay tribute today to the Fijian people. I say to you today before the world: This was your victory. Whichever candidate you chose, yours was a vote for a better future for our nation. I pledge again that I will govern for the benefit of all our citizens, no matter who they are, where they come from or who they voted for. Mine will be an inclusive Government over the next four years. I will be the leader of all Fijians, for all Fijians. And as we move our beloved nation forward, I am determined to leave no-one behind. In that spirit, I extend a hand of friendship to my political opponents. Whatever our differences, let us work together constructively in our new Parliament – when it convenes on October 6th – to improve the lives of every Fijian. We are currently enjoying the most sustained period of economic growth in our history. The possibility to create more jobs and raise the living standards of our people has never been greater. Let us join hands to put our nation first. I want to assure our Pacific neighbours of Fiji’s continuing contribution to the region –working together in a collaborative manner to resolve the great challenges we face to develop our economies and improve the lives of all Pacific islanders. Fiji has played a lead role in the formation of the Pacific Islands Development Forum – an addition to the existing regional framework that for the first time, links Governments with civil society groups and the private sector in a joint effort to solve our development problems in a sustainable manner. Fiji is privileged to have been given the responsibility of hosting the PIDF Secretariat in Suva – our capital. And we were equally privileged to have had as our chief guest at this year’s Forum in June, the outgoing Indonesian President, Susilo Bambang Yudhoyono. In this International Year of the Small Island Developing States, we need a more concerted effort to strengthen our regional institutions to confront the enormous challenges we face in the Pacific: Population growth, the unsustainable use of our ocean’s natural resources and rising sea levels caused by climate change, which threatens to engulf some of our Pacific Island states altogether and is already forcing the evacuation of coastal villages in Fiji. I repeat here what I have said in other forums: that history will judge the world’s major carbon emitters extremely harshly unless they take immediate and comprehensive steps to reduce emissions. It is simply not acceptable – purely in moral terms – for the world to allow the small island developing states to sink slowly beneath the waves because of the selfish determination of industrialised nations to protect their own economies. Time is fast running out and I beg you all to act. I am also here to rededicate ourselves as a nation to the ideals of the United Nations and to its service whenever and wherever it is required. This service is at the core of our foreign policy, whose central purpose to be “friends to all and enemies to none”. It has been our privilege to Chair the biggest voting bloc at the UN – the G77 plus China – and to this year assume the Presidency of the Executive Board of the United Nations Development Program. For some 36 years now, Fiji has proudly contributed our troops to successive peacekeeping operations in Lebanon, Sinai, Iraq, Syria, Timor Leste, South Sudan, Dafur, Liberia, Bosnia, Kosovo, Kuwait, Namibia, Cambodia, and in the Solomon Islands. Some of these peacekeepers have paid with their lives – as have troops from other countries – and we honour those who have fallen in the cause of peace. Last month, 45 of our soldiers currently serving with the United Nations Disengagement Observer Force were held captive. As a nation, we held grave fears for their safety but after two anxious weeks, our prayers were answered and our men were freed. I want to thank the skilful team of UN negotiators who worked with our own military officers and diplomats in a tireless effort to secure the release of our men. I also warmly thank those nations who came to Fiji’s assistance during this testing period. We will never forget your role in keeping our men safe so that they can continue to fulfill their UN mandate and eventually return safely to their families and friends in Fiji. I’m proud to say that not once during the course of this crisis were there any calls in Fiji for our troops to be withdrawn from this or future Peacekeeping missions. It is a noble cause and is our contribution to the welfare of ordinary men and women living in less fortunate circumstances far from our island home. I want you all to know that Fiji will always be ready to serve. Mr President, To strengthen our commitment to meeting our international obligations, this year Fiji opened a Permanent Mission to the United Nations in Geneva. It is in the process of raising our interaction with treaty bodies such as the Human Rights Council, the International Labour Organisation, the World Trade Organisation, the World Intellectual Property Organisation, the International Telecommunications Union and other organisations based in Geneva. In closing, Fiji looks forward to contributing positively to the work of the United Nations during your stewardship of the 69th session of the General Assembly. On behalf of all Fijians, I pledge our full support and co-operation as you carry out the task before you in the cause of the great global family to which we all belong.